Where adventure takes flight! Bringing you the finest pulp action novels and anthologies by today’s new pulp scribes directly to you in the universal PDF format. 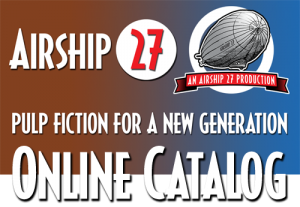 For all Loyal Airmen, a neat Airship 27 Cap and baseball jersey. High Adventure takes flight with Airship 27 gear. Just being a good civil servant doesn’t get the bills paid. Available at: Selling Mr.Jigsaw & other great comics. 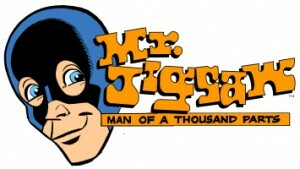 Here you will find all our Mr.Jigsaw comics, several graphic novels and single issues specials. All written by Ron Fortier and produced and designed by Rob Davis. Episodes From The Zero Hour – Vol 2. Story by Ron Fortier and art by Dave Flora. Warrior’s Heart is the story of Father Michael Ryan, an ex-Marine Chaplain now back on the streets of Federal City where the enemy now wears three piece suits and fedoras. One man of faith takes on the mob in two-fisted action. A 48 page, full color children’s book about the building of a very special playground. Written by Ron Fortier & Alan Horne, with art by Gary Kato. Join Team Hazzard with these official shirts and mugs.